10 Ways To De-stress And Clear Your Mind. Stress is practically a constant for the average modern American. It is pervasive in our lives, and it causes numerous and sundry health issues. On a basic level, stress can directly cause shallow and rapid breathing which affects the oxygenation of your body, anxiety, weight fluctuation, and it can suppress your immune system. It also puts you at an increased risk for obesity, heart disease, Alzheimer’s disease, diabetes, depression, gastrointestinal problems, and asthma. 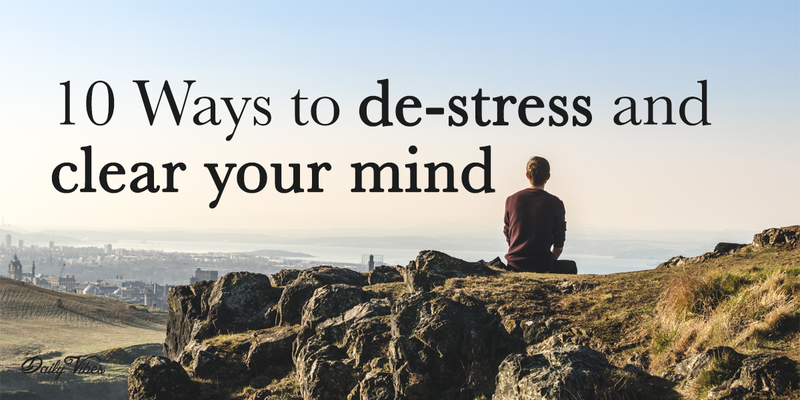 It is essential to have healthy, effective methods of coping with this stress in order to keep your mind and body in good functioning condition. It will also improve your mood and help you to live a happier, serene life. 1. Be grateful for each lesson. It can be challenging to find the silver lining in every difficult or negative situation, but even if you can’t find the good result, you can always learn a good lesson. Every experience you will ever have in life can teach you something you didn’t know before. Just be open minded and receptive to it. 2. Surround yourself with plants/nature. Not only can adding plants to a room literally filter the air around you, but studies have shown that the color green, and those hues found in nature and plants specifically helps to calm us and put us at ease. It lightens our mood and keeps us content, it can even fight depression. A simple potted aloe plant can be as useful as an indoor vine or tree, you don’t have to be in the middle of the forest to feel the benefits. 3. Offer encouragement to someone else. It may not be your first instinct when you’re feeling frazzled or down to pay compliments and kindness to others, but science tells us that offering the very same treatment we’re craving to someone else can in fact make us feel better. You’ve also got the added perk of just doing or saying something nice for another person. Who knows? Maybe it’s exactly what they needed to hear at that moment. You might just change their whole day. You can’t change the past. You can’t make behaviors or events different after they’ve transpired. You also cannot predict the future. The only thing you have any control over is the present. You can do your best to remember the lessons of your past and make decisions that will be beneficial in the future, but you cannot affect either of those things by obsessing or worrying or harboring regrets. Live for the now, it’s the only real way to live your best life. 5. Draw inspiration from meaningful quotes. The words of those who have gone before us are of immeasurable value. While each life that occurs on this planet over time is different in infinite ways, there are also always similarities. You might be surprised to find the wisdom of an ancient artist or philosopher as applicable and eye-opening today as it was thousands of years ago. 6. Have a cup o’ Joe. Coffee is rich in antioxidants, which fight free radicals and boost the immune system. It also stimulates your pheromones and energy levels, putting you in a good mood and giving you that extra kick you might need to get yourself going. A healthy cup of coffee (with minimal additives like sugar, flavors or creams) every day can be a great thing! 7. Take a brisk walk. It’s always a good idea to spend a few minutes in the company of nature, but this can work even if you’re in the middle of a bustling city. The purpose of taking a walk on your own is to put yourself into a meditative mindset by invoking what is called “involuntary attention”, this is what happens when we engage in an activity which requires some level of focus (the walking itself) but allows us to reflect and think about other things at the same time. It may sound crazy, but repeatedly smiling with the muscles of your face can actually help to reset your mood, even if you weren’t feeling cheery to begin with. Doing it in front of a mirror is helpful for some people, but if you do it in public to passersby, you may also get some great smiles thrown back in your direction which is also a big mood booster. 9. Find a furry friend. Adopting a friendly dog or cat can be a great source of comfort, a boost of confidence, and a lesson in uncomplicated affection. No one will love you more unconditionally than a loyal pet, and we could stand to learn a lot about living in the moment from our animal friends as well. People with pets also tend to have less anxiety than those living on their own. While using devices with bright screens too late at night can directly affect your brain’s ability to produce melatonin (the chemical that tells us it’s night time and we need to be asleep), there are also plenty of other reasons to put the tablet/laptop/Iphone down. Constant overstimulation from all these modern devices can cause sensory overload. When we get so deeply involved in a life online that we’re essentially living two lives and trying to keep up with all that entails, we can become overwhelmed. Sometimes the best thing you can do for yourself is take a few days or weeks off. Set up activities that you can do instead of scrolling through page after page online, get outside, spend face to face time with friends or just spend a little quality time alone with a good book. This rejuvenates and re-energizes our minds, it can also be a great way to learn more about yourself.